This particular example has a wonderful golden color and clarity, with subtle yet present hop character. 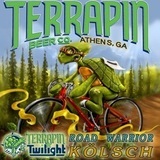 The Terrapin Road Warrior is brewed in honor of the Athens Terrapin Twilight Criterium, a professional bike race held in downtown Athens. Spike mimicked the exact process and ingredients that make a German-style kolsch great. Kolsch is a light-bodied, lightly hopped style that hails from Cologne, Germany. Look for it on draft exclusively in the Athens area and at the Terrapin Twilight Criterium!